Another way of putting this is could be “right place, right time”. It’s often the unpredictable fleeting moments that, if you capture them, make interesting, funny and outstanding photos. 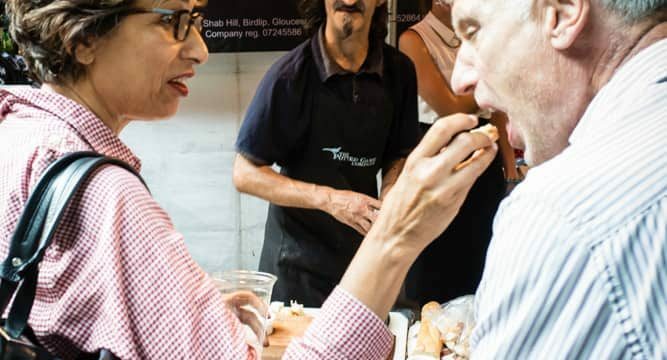 To illustrate, here’s a shot of a moment which lasted for less than a second, but which turned an ordinary photo of a couple browsing a food stall into a captivating image of a couple enjoying a food stall. The shot was captured mainly by luck. But, I maximised my chances of creating a good shot by walking around the market looking for interesting characters, places where the light was good, areas of activity. and situations with possibilities for strong compositions. Additionally, because the light was fairly even everywhere in the market I had my camera set on manual mode so I could be sure of my exposure being good. I knew my shutter speed was fast enough to prevent camera shake and freeze most movement (1/80s), aperture was f4, and ISO 800. A combination which gave me a good exposure without having to resort to a very high ISO or very narrow depth of field. I was actually trying to get an interesting portrait of the stall holder, framed between the couple’s shoulders. All three were distracted by the food, and didn’t notice me. 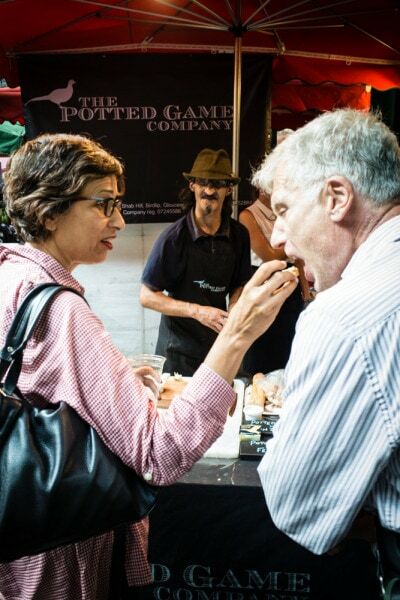 I took a couple of shots, and then, while the camera was still to my eye, the lady presented a tasty morsel to her husband and, being in the right place at the right time, I grabbed the shot. – Be prepared: ensure your camera is set up so that when you press the shutter the image will be correctly exposed and sharp. There is nothing worse than missing a shot because you’re fiddling with your camera settings. – Check out your location: take some time to wander round the place you are photographing and get a feel for places with activity happening, interesting backgrounds, where the good light is, unusual characters and opportunities for strong compositions. – Be patient: You may find a really interesting spot, with great light, lovely foreground and background, but just lacking an interesting character. Set your camera and composition up and wait for the action to unfold in front of you. – Shoot often: Take a few images, then take a few more. Avoid the temptation to check every image as soon as you take it. You will maximise you chances of getting good photos by having your camera to your eye, rather than by reviewing your images.